So here they are! I couldn't decide what images to pick for these boxes. I like the ginger bread man, stocking, candy cane, reindeer, etc. - but I had to narrow these down to the easiest to cut or the ones more suitable to be cut in half for closing the box. The snowman takes a little more effort but I think he looks cute. 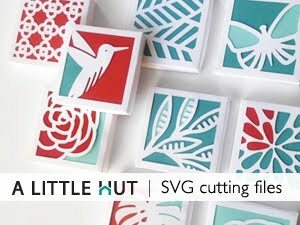 Fill your boxes with small treats, make one for each day of advent, for party favors or fill them with strips of paper with small gifts of your time—something like holiday coupons. The thought of the holiday coupons sparked this idea. How about hanging your gifts of time/coupons from the tree itself? 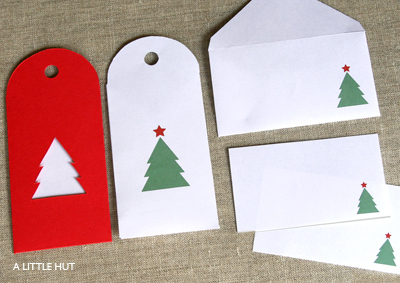 So here are printable templates that can be hung as tree decorations or used as gift tags. What would you like to get on a coupon? Help with chores, a back rub, an afternoon off to go anywhere/do anything? What? Anyone game to share some ideas? I need some for our coupons. Me? I'm an easy girl to please. Breakfast in bed (more often) or more help with the cooking would be wonderful. so cute as usual! good job yet again! Dishes for a week, including counter wipe up. (It's that last bit that never seems to get done). 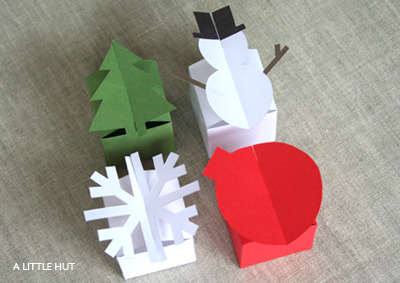 Very cute boxes- your shop looks very festive! A gift coupon... How about a few hours off from anything to do whatever you please? Ohh they are so great, i would love to see more christmas designs, like a turkey, a menorah, cookies, etc. Hope you do more. i like all of them but i favor the green tree. Oh I love the boxes - they are perfect for little holiday treats! What a great idea! I am going to use your envelope/coupon idea for my advent this year on my tree. Perfect! I hope you don't mind - I added these on my holiday love - on the right side of my blog! So cute!